Bill is a professional prop maker who runs his own company, Punished Props, out of the Seattle area. He has been an enthusiastic cosplayer ever since his friends made him be a part of their Team Fortress 2 group for PAX back in 2009. In 2012, he quit his corporate day job to take his prop making craft full time! Kevin is a graphic designer from southeastern Wisconsin. 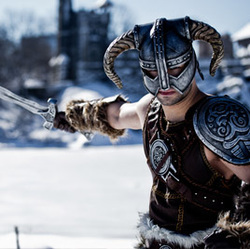 He got his start in cosplay in 2009 while studying animation in college, where one of his roommates invited him to a convention. He’s been fervently donning armor and tactical gear ever since. His other hobbies include drawing, laser tag, video games, and especially cooking. 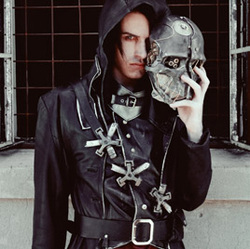 Collin is a cosplayer, fabricator, and the creator of Desolate Creations. 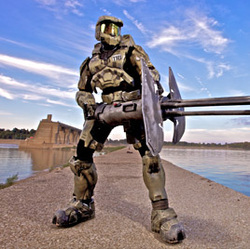 He’s made several costumes over the last 7 years, including his showcase Halo armor, Resident Evil Executioner suit, Darth Vader, and Predator. 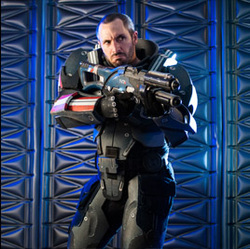 And, he’s been involved in many projects – from a Lindsey Stirling and William Joseph music video, Devin Graham’s FPS Halo Video, FreakinRad’s Halo Respawn Series, and the XBLGamerhub Maximus 116 videos (which were created by Collin’s team). 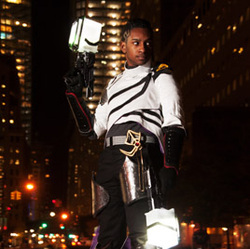 Danquish is a cosplay, ninja, giant robot, and Shiba Inu fan. He got into costuming 4 years ago, when he discovered he could extend his love for recreating his favorite characters to more than just once a year at Halloween. Danquish has attended numerous cons, making great friends along the way and meetings some of his personal cosplay and creative heroes – all while bringing smiles to fans who share the passion for characters he strives to recreate. 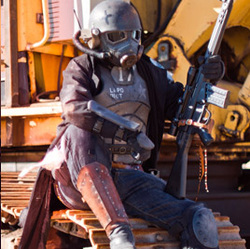 Trey began cosplaying in 2002, when he joined the 501st. From movies, comics, and video games, Trey’s cosplay now spans the galaxy! Most notable is his “special thanks” credit in Army of TWO: The 40th Day for when he and Ben Dickinson inspired the marketing team of EA to bring the duo to PAX 2009. Trey’s Superman also made the cover of the New York Times and was handpicked by WB marketing to help promote the new Man of Steel movie locally. Allen works out of both his personal studio and TechShop Chandler in sunny Arizona. He was raised on Saturday morning cartoons, science fiction, and monster movies, which continue to influence his creations. 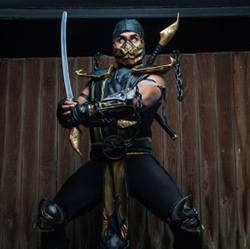 In 2009, he created his own costume and prop business and has since won awards and accolades for his ability to bring artistic concepts and renderings to life, as wearable costumes and displayable props. Sylar began cosplaying in 2009, and has been doing so alongside Sheila Santa Maria (there's an extra space after Sheila) as a member of their award-winning team, Aicosu, ever since. He is currently enrolled in the Academy of Art University in San Francisco where he studies film and motion picture, in hopes of becoming a voice over actor for films, games, TV shows, and anime. During the day, Rick is a family man with a beautiful daughter and works as a teacher during the week while he studies biology. He balances his time in order to pursue his incredible costuming hobby and activities, often collaborating with his wife. 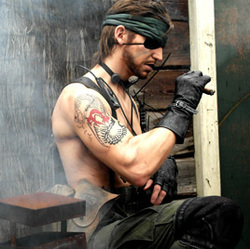 Rick’s passion is bringing gaming and movie characters to life and he is well known for his Metal Gear Solid and Assassin’s Creed cosplay work. Raul is the owner and operator of a game truck. Six years ago, Raul was dared to make a transforming Optimus Prime costume – he loves challenges! – which propelled him into the cosplay scene. 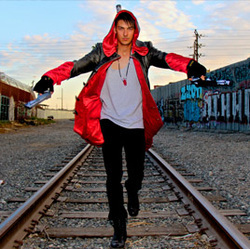 His Scorpion costume is another catalyst for improving and promoting his work. A fan of cosplaying characters he grew up with, Raul teases that a classic RoboCop costume is in the works. Ben is an 80’s child, gaming fan, and father of 4 awesome kids (who often costume with him). His cosplay career launched in 2003 with his Spider-Man – a costume that propelled him to work on more in addition to joining organizations like the Arizona Avengers and the 501st. 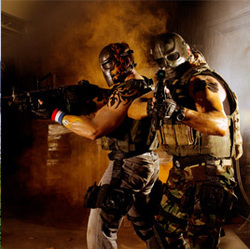 Ben hit the cosplay gaming landscape when he paired up with Trey Moore for an Army of TWO team (also pictured in this calendar). Cap started cosplaying in 2006 and made an impact when he donned the mask and shield as Captain America’s Bucky Barnes, in honor of his father. Born and raised in New York City, Cap has traveled all over the country and made a name for himself by winning numerous costume contests. In addition to modeling and acting, he is a founding member of Together Brothers Productions and can be found on various covers for novels such as Paltronis and Redeem the Knight: Blood Ties. Philip and Marshall, best friends since childhood, set out to make their nostalgic memories of playing Street Fighter (for hours on end!) a reality before attending their first comicon. 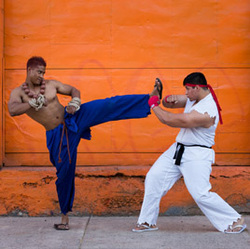 The two have only improved on their cosplaying appearances and have taken over the Street Fighter scene at many comicons since – including San Diego International! Born and raised in New York, Kadeem is a college student at St. John’s University studying to be a computer scientist. In 2009, he attended his first con, the New York Anime Fest. Feeling something was missing, Kadeem wanted to become a cosplayer himself. 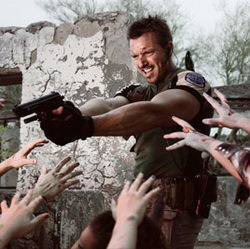 Over time, he made cosplayer friends who introduced him to sewing, posing, prop making, editing, and more. His plans to eventually travel to a west coast convention and keep learning! Based out of Australia, Jason is a very active, friendly, and energized person. A carpenter/joiner by trade, he cosplays in his free time. 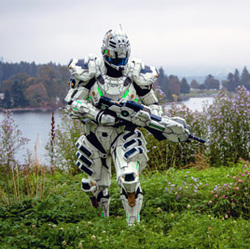 Outside of cosplay, he spends his time out hanging with mates, painting miniatures, and playing professional paintball. His major influence for cosplaying comes from all the wonderful people he’s met at conventions over the past few years, who were instrumental in finding ways to make his ideas into reality. Garett (aka Nerd Swagoo) is an analytical artist who is currently wrapping up his Bachelor of Science in Human Biology and plans to transition into the public health field to work in water treatment and distribution. Brainy with an artistic side, Garett is new to the cosplay scene, which he uses as an artistic outlet. 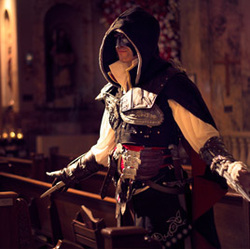 When he does cosplay, his approach is to phase in and emulate the character, similar to acting. Mike is a costume and prop maker whose expertise shines in his Warhammer 40K showcase project – his Ultramarine. 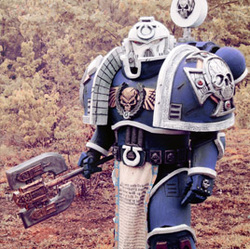 His Ultramarine costume has been featured in various outlets, including: the 1,000 Incredible Costume and Cosplay Ideas book, Warhammer fan sites and the Lexicanum. 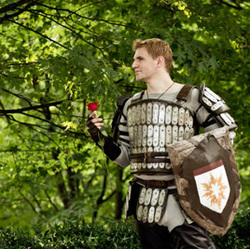 Mike spends his free time with his wife and project supporter, Aleisha, or helping others with their own adventures into armor building and cosplay. Three days before Christmas 2011, Jason was diagnosed with Non-Hodgkin’s Lymphoma, a type of cancer. After surviving a miserable six months of radiation and chemotherapy, Jason’s cancer entered remission – a status that thankfully continues. 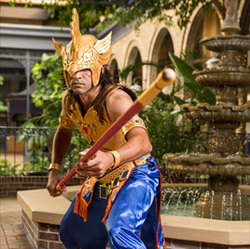 After he started feeling better, he and his wife (Pink Justice Cosplay) began work on his Kilik costume from Soul Calibur V. To Jason, cosplaying is about obtaining a goal and feeling proud of yourself.